Tony Goldwyn is in a blissful marital life of three decades with a special partner. Despite some rumors and speculations that could put the entire relationship in jeopardy, the couple stuck together with love and trust they have carried since day one. Couples that stay together for decades are definitely relationship goals. However, the path might not always be plain sailing. There shall be challenges along the way. The key remains how you tackle them and how much effort you put to keep hold of your relationship. Tony Goldwyn is married to his wife Jane Musky. The couple tied the knot in 1987. Tony and Jane belong to the same professional background. The only difference is Jane works off-screen as a production designer while Tony appears on-screen as an actor. Working in the same industry could be one of the reasons for their beautiful bond and understanding. Although Jane is six years older than Tony, the age difference never seems to matter in the love and affection they carry for each other. The couple prefers to be as distant as possible from all sorts of controversies and rumors since their marriage. Speaking to Housekeeping, Tony mentioned the best part of his busy day is going to bed at night with his wife. Moreover, the actor claimed he finds himself lucky to do so. The celebrity duo apparently dated two years prior to their wedding. Moreover, they appear happy together ever since they exchanged vows in the 80s. Meanwhile, the couple shares two children, both daughters named Anna Musky-Goldwyn and Tess Frances Goldwyn. The entire family of four lives together in their home in Beverly Hills, Los Angeles which is believed to be worth more than $2 million. Tony is actually influenced by his parent's relationship. He once said: "there should be always 50-50 partnership". His mother who left her career behind for her husband never really received much care from his father that she deserved. This is one of the biggest reasons Goldwyn says he wants to keep his wife in first priority. Their daughters Anna and Tess are full grown ups now who carry the same ideology that "50-50 partnership" is the norm one must keep in a relationship. 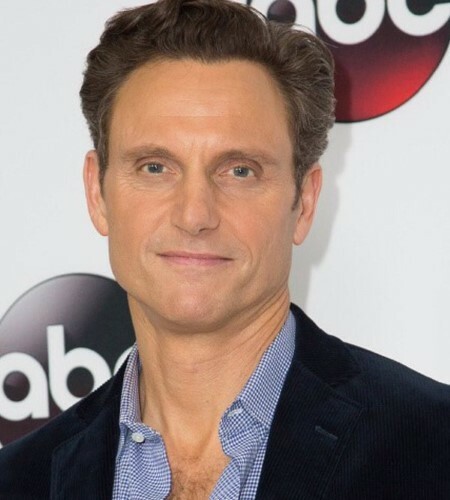 Although the couple's relationship is built on love and trust, the rumors of Tony Goldwyn's off-screen romance with Kerry Washington brought some questions on a commitment to his marriage. Goldwyn was found enjoying a romantic dinner with a woman who was not his wife. It was claimed they were deep in a conversation like in their own little world. However, to date, these cheating speculations does not seem to matter as the couple has managed to keep a healthy relationship. Recently, Tony was spotted with Huma Abedin at Disneyland in the Californian Sunshine in 2018. However, Jane never responded to any speculation regarding this. In fact, Jane went on to reveal she never watches any of her husband's shows which could create a problem for her family. Tony too revealed how he tries to keep their marriage fresh. "My wife is impossible to surprise, but for her 50th birthday, I had about 70 friends from all over the world waiting when she walked into the restaurant — she was shocked. We have a Sunday ritual where I make a really great breakfast, like waffles; later we follow it up with a big home-cooked dinner." "The best part of my day is going to bed every night with Jane. I still feel lucky about that. A "guys' night out" for me is…being with my wife! Since I'm at work a lot, I want to be with her when I'm home." Despite various speculations floating around, this adorable couple definitely loves to keep the romance flowing into their relationship. The love and trust they carry are certainly admirable. Born on 20th May 1960 in Los Angeles, California. His birth sign is Taurus. His parents are Jennifer Howard and Samuel Goldwyn Jr. He is the grandson of legendary film producer Samuel Goldwyn. He is best known to his fans as President Fitzgerald Grant on the hit ABC drama series Scandal. He graduated from Hamilton College with a Bachelor of Fine Arts degree. He studied at the London Academy of Music and Dramatic Art. He played the role of Carl Bruner in the film Ghost which was released in 1990. He played the title role opposite Minnie Driver in Disney's Tarzan. His net worth is estimated to be $6 million.